Hello darlings, I would wish you all a Happy New Year but it's been over 3 weeks since NYE so I shan't bother. Apologies for the total lack of posts since 2015, I've started at least 3 on here but never seem to find the inclination to finish any of them! Until now anyway. When I last blogged (last year!) 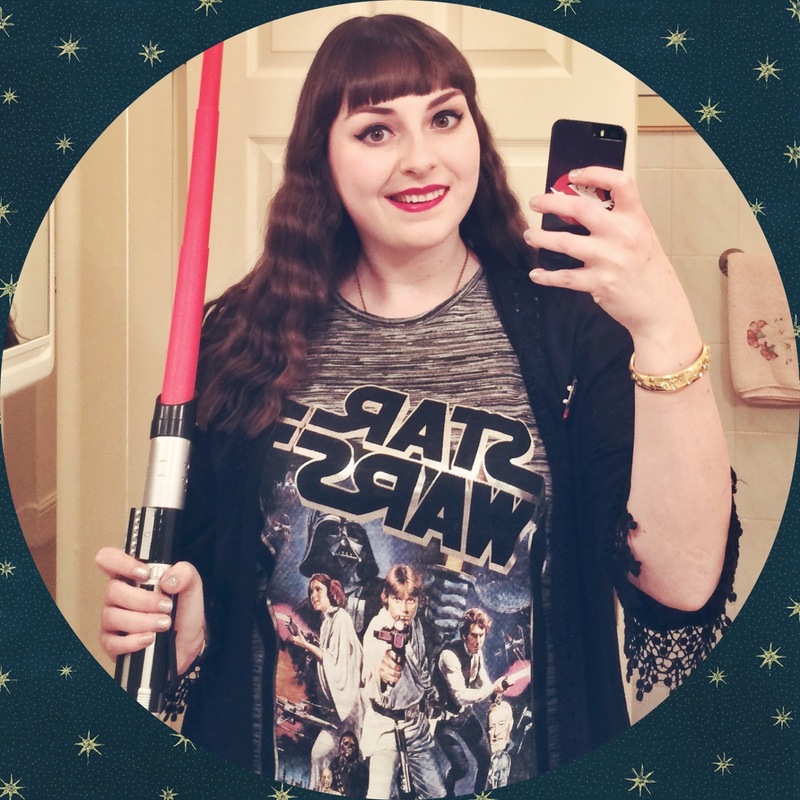 I promised to do a post all about Star Wars... and you know i'd hate to disappoint you. I want to start off by saying that there are NO spoilers in this post, so if you haven't seen The Force Awakens or any of the Star Wars films, don't worry, I'm not about to spoil any of them for you. So let's crack on! But first let me set the mood. Click play then carry on reading. So then, Star Wars. If you're not a fan then you're probably rolling your eyes right about now thinking how you're SICK of hearing about Star Wars all the time... but if you ARE one of the sensible ones who likes/loves Star Wars then you'll no doubt rather enjoy this post. 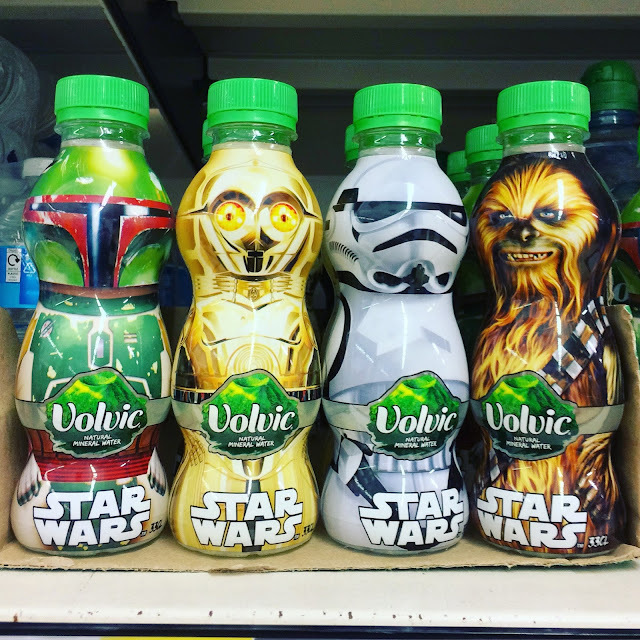 I for one absolutely ruddy LOVE Star Wars. I was born in 1991 so practically all of the media I grew up watching/reading/listening to was from the 70's and 80's. Growing up I was allowed to borrow videos from my dad's movie collection and as a child, one of my favourite ways to spend a Saturday or Sunday was to watch all three original Star Wars films back to back. I could read before I started school aged 4 and although I spent most of my time playing in the garden or indoors, I was never discouraged from watching TV or videos if I wanted to. This means that I grew up with a love for movies, especially the Star Wars ones. 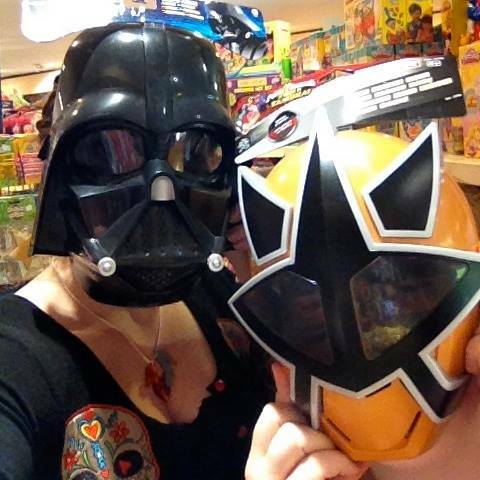 When I was at Primary School my parents took me on holiday to Las Vegas and there is a photo somewhere (I tried to find it but wherever it is, It's well hidden) of me in FAO Schwarz standing with a life-size Darth Vader with a massive smile on my face. as you can see... things haven't changed much in the last 16 years! To be honest my choices in VHS material weren't monitored very well. Sure my parents had told me not to pick any of the films with the red circle showing 15 or 18 but that was just a suggestion, right?! I watched the Exorcist when I was 7, surprisingly it didn't affect me at all but when I watched Alien aged 8 I had nightmares for weeks. You'd think this might scare me away from Sci-Fi for good, but when it came to Star Wars too much was never enough. 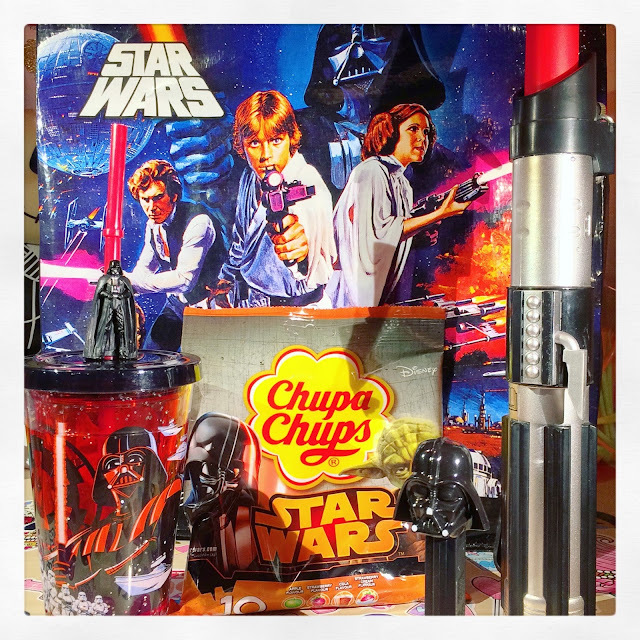 just 'some' of the Star Wars goodies I took with me to the Cinema on TFA opening night. The kinds of films I would watch over and over and over again until I could practically quote them by heart included all 3 Star Wars, Ghostbusters and the Blues Brothers. At school one or two of my female friends had heard of Luke Skywalker, Darth Vader or Princess Leia, but none of them were interested in playing playground games with make-believe lightsabers or spaceships. There was no chance I'd get to run around the playground flying an invisible Millennium Falcon with my best friends, because they wouldn't know a Corellian YT-1300 light freighter if it fell from the sky (as you can probably tell, I was a Geek from a young age). Star Wars water spotted in a local shop in January 2016. and NO, I didn't buy any. Growing up I tried to hide my geeky tendencies from friends, well the female ones at least. The 1 time I remember admitting that I loved Star Wars and watched Star Trek on TV pretty much every day to my female friends, I was met wish looks of horror and simply asked 'Why?!'. But by the time I reached sixth form I found myself one of only 2 girls in a Design & Technology class full of boys and for the first time ever I had no reason not to join in and talk about sci-fi movies, video games and other geeky stuff, you know... the FUN stuff! Since then I've never seen the point in pretending that I don't like something I secretly do. yes, that is me on the left. good guess. To me Star Wars was and always will be an escape. As soon as the music builds and the opening crawl begins, you're already being taken away, across the galaxy to witness new worlds and creatures. To this day the Star Wars score gives me chills, no matter where or when I hear it. I know that in the lead up to the new movie I've probably driven my friends and family MAD with my excitement over each new trailer release and snippet of cast/plot info. Sorry but I'm NOT SORRY! 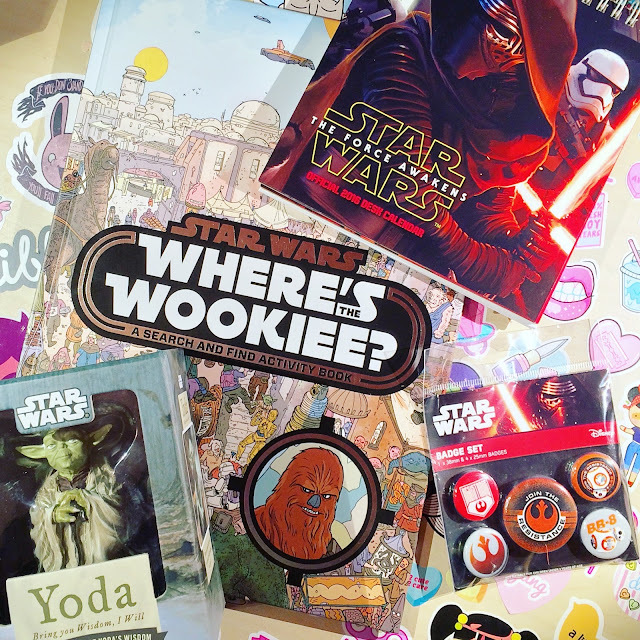 the amazing Star Wars gifts my friend Danny got me for Christmas 2015. 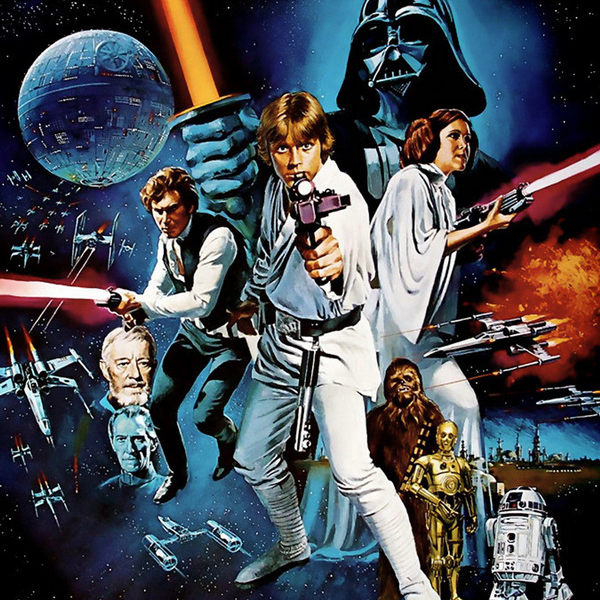 It's been at least 20 years since I first saw 'Episode IV: A New Hope' but I never grew out of my love for Star Wars. Sure the early noughties saw the arrival of the prequel movies (but we do not speak of those!) and there's been frequent talk over the years about possible reboots or sequels, but I was happy enough rewatching the originals and imagining how the story might one day continue. Thankfully December 2015 gave us all just that. The Force Awakens has already broken several box office records and will probably continue to take over the world (if it hasn't already). I think it's success is mostly due to the fresh new characters introduced in the film. I mean yes, it was incredible seeing some of the original cast return but it didn't take long for me to get way more excited about the new characters. Me after seeing TFA on opening night. Yes I really do love 'Rats Sraw'. I've been to the cinema to see The Force Awakens 4 times since it opened, which is a personal record for me but somehow doesn't seem like nearly enough times. It's no secret that I LOVE this film. Sure it has a few plot holes and you leave the film with more questions than answers but OH MY GOSH IT IS SOOOO GOOD! I love everything about it, the action and the drama, the new villains, the new heroes, it's just all very brilliant. the original movies centered around the trio of Luke, Leia and Han, and the new movie gave us the similar 'dream team' of Rey, Finn and Poe. It didn't take much to win me over to adoring these new characters! 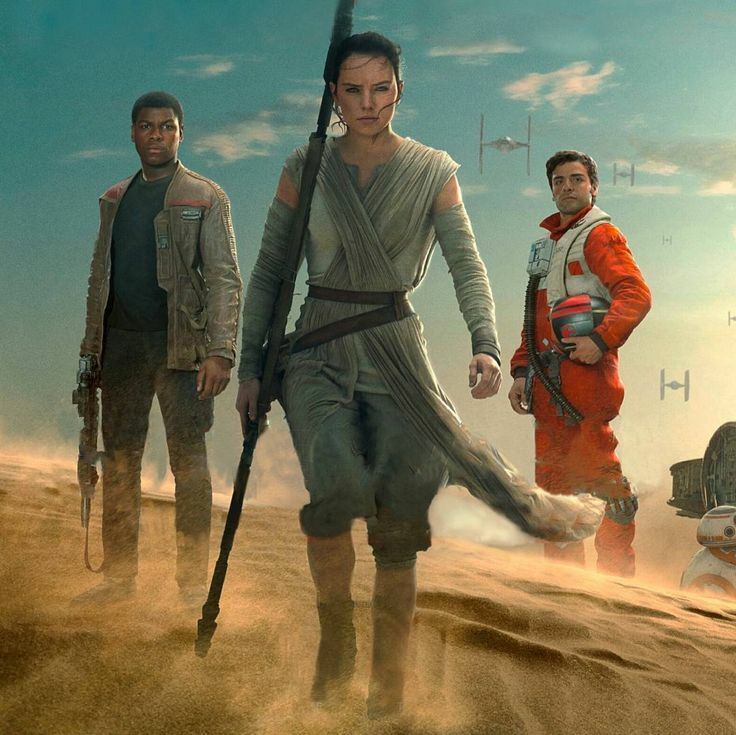 I was already a fan of Oscar Isaac (Poe Dameron, on the right) and Finn (John Boyega, left) and Rey (Daisy Ridley, middle) are both fantastic and funny and BRILLIANT! And yeah, I like the new 'baddie' as well, Adam Driver as Kylo Ren is awesome, but it's the trio above that really stole the show. 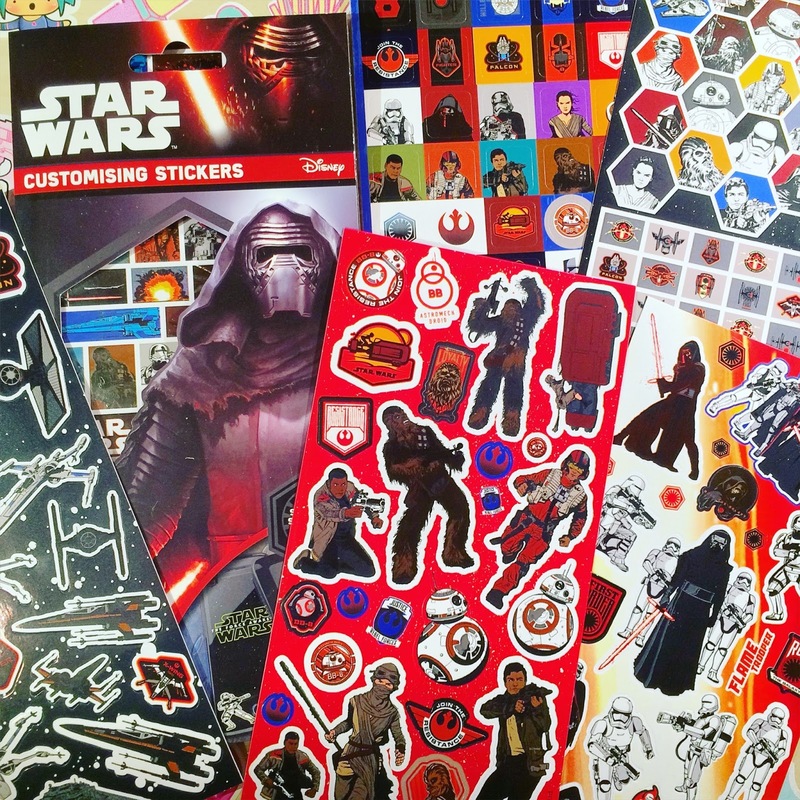 the 300 Star Wars stickers I bought to decorate my desk. for Science. I'm hopeless at drawing guys, I mean I'd love to have a go at illustrating Finn and Poe but it will only end badly. 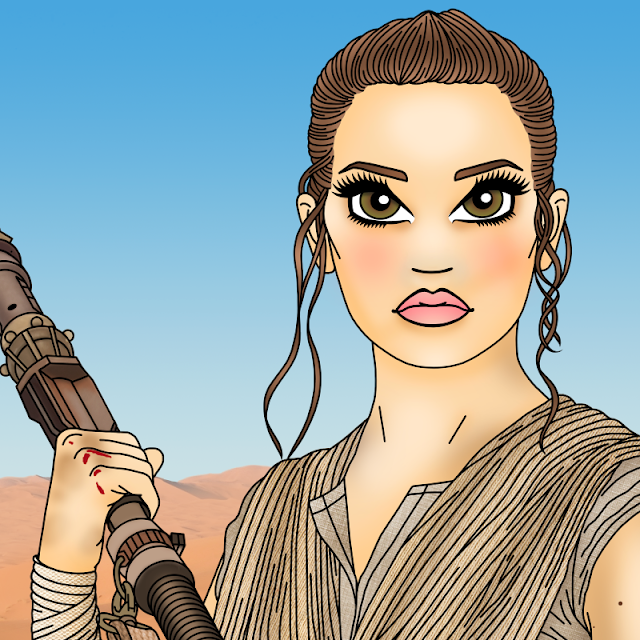 + Rey is the MAIN CHARACTER, so I decided to have a go at drawing her. Now as I've said many times, I'm not great at making my drawings look like the people they're supposed to, so bear that in mind here. 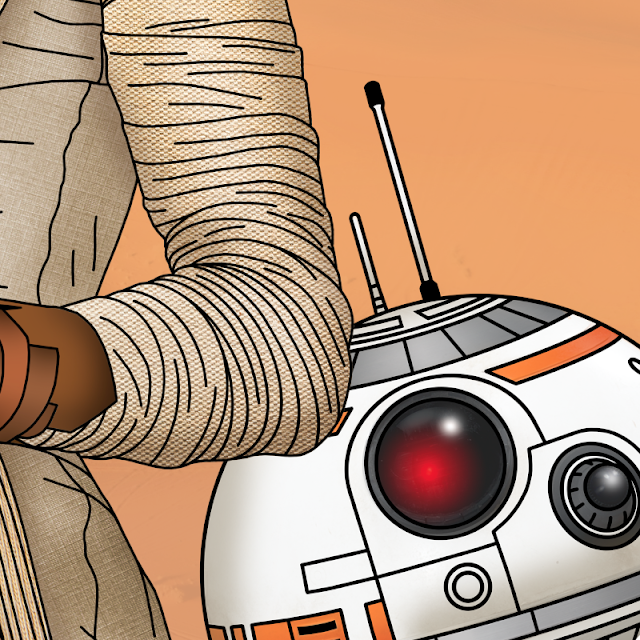 I tried my best though, I even added BB-8 to keep her company on Jakku. So... here's my fanart of Rey. The detail on this one nearly killed me! I considered giving up soooo many times, or kept asking myself why I had to draw every single fold and crease in the clothing. But it was probably worth it right?! To be honest I can't remember the last time I drew someone who didn't have rainbow hair or candy coloured clothes. It was strange to use such a muted palette, but somehow Rey wouldn't look right in a pink outfit! 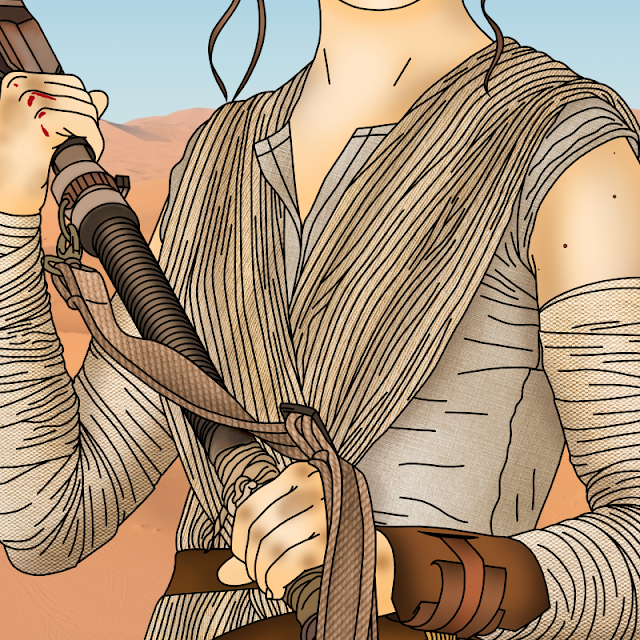 She's a scavenger on a desert planet, she's a survivor and a fighter, hence the bloody knuckles and dirty, worn clothing. She's also utterly BRILLIANT and amazing and perfect! I added lots of textures to the fabrics as you can see, and it took forever. But you know what, it was still super fun to work on this one. 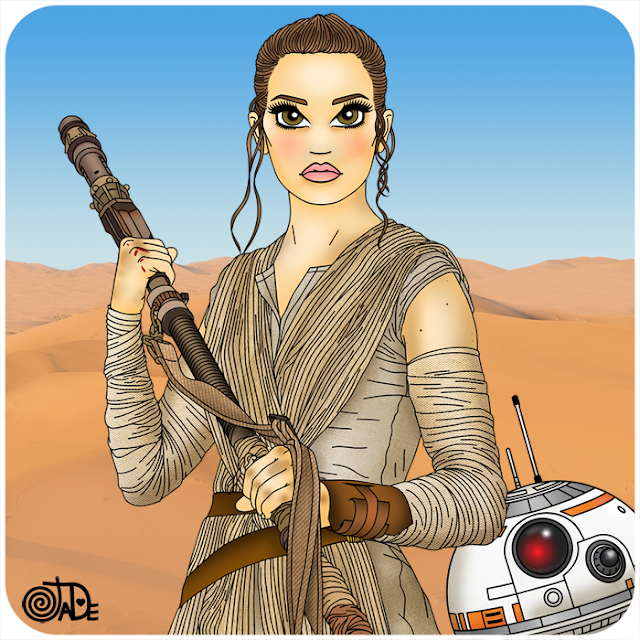 Probably because I listened to the Force Awakens score on repeat while I drew/edited. But what else was I supposed to listen to?! if you've a keen eye, you might have noticed throughout the post that I'm a bit of a Darth Vader fan, and yes... my lightsaber is red just like the ones belonging to the Sith (no, that's not a typo). I'm not sure why but I've always sided with the dark side, being a Jedi just seems kind of boring sometimes. The Sith get to dress in black, wield blood red lightsabers and generally go around being dangerous and badass. 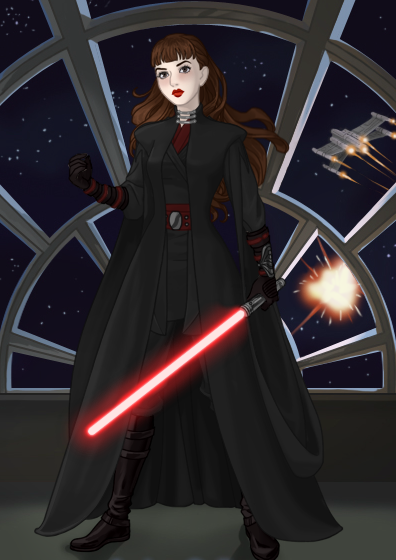 Thanks to an online dress-up game, I had a go at dreaming up what I might look like as a Sith and I think it's safe to say that Sith Jade would be EPIC! Black and Red are my favourite colours so on a very basic level it makes sense that i'd align with the Empire/First Order. Sure they're all morally corrupted and power mad, yes they often go around murdering people and messing stuff up but hey... they sure look good while doing it. Hmm I'm not really selling it am I?! Ah well. 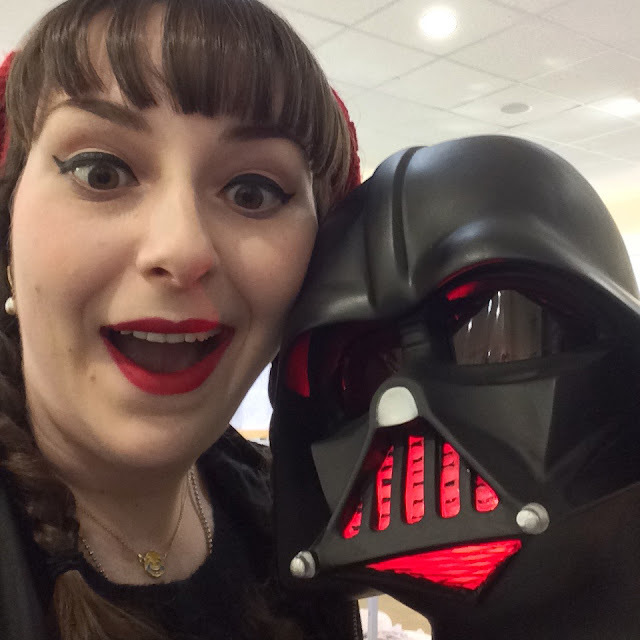 Anyway, the point of this post is that yes, I do love Star Wars, and no... I will never grow out of it. Now all I have to do is keep waiting along with everyone else for the next installment, Episode VIII in December 2017. At least we have the Rogue One movie this December, just give me ALL THE STAR WARS! so on that note i'll say goodbye, i'll try and blog again soon but we all know there's a chance you might not hear from me on here again for a few months. so until then... May the Force be with you!